This page is intended to give you an idea of the content of the literature that we use in meetings. Literature cannot be bought on-line, it is available at Gam-Anon meetings. If you represent a meeting and require more books then contact your LDC, if you don’t know who this is, e-mail the National Secretary (nsosec@gamanon.org.uk). Gam-Anon literature can be used for topics at meetings, for private discussion with sponsors and Gam-Anon friends, as well as for personal growth and reflection. These books and pamphlets may not be copied. The Gam-Anon Way of Life – A Gam-Anon Manual – 60 pages – This is the book that is used at every meeting. Contains the Suggested Welcome, Steps, Unity Steps, Purposes of Gam-Anon, Tools of the Program, Trust…the Myths and Realities, Suggested Points, Frequently Asked Questions with Answers… and more. Gam-Anon is a fellowship of men and women who have been affected by the gambling problem. If you are seeking a solution for living with this problem, we would like you to feel that we understand, as perhaps few can. We, too, are familiar with worry and sleepless nights and promises made only to be broken. Living with the effects of someone else’s gambling is too devastating for most people to bear without help. In Gam-Anon we learn we are not responsible for another person’s disease or their recovery from it. We let go of our focus on the gambler’s behaviour and begin to lead happier and more manageable lives for ourselves. The Twelve Steps of Gam-Anon, which we follow, are not easy. At first, we may think that some of them are unnecessary; but we soon learn that they apply to us as well as to the compulsive gambler. The benefits to be derived from a strict and constant observance of them can be limitless. Gam-Anon…offers self-help recovery whether or not the gambler seeks help or even recognizes the existence of a gambling problem. Living With the Compulsive Gambler – Over 140 pages of member’s experiences, meditations, poetry, explanations of Steps and Unity Program, history of Gam-Anon. We in Gam-Anon must remember that in order to survive we must have power and energy. We can get the benefit of both from our rooms (Gam-Anon meetings). By making (attending) meetings we are open to the power of many years of experience. We must also be willing to accept the comments offered to us and work on them, helping us to make it through the most trying days. We gather the strength and energy from this power to succeed where we had previously felt hopeless and lost. Always remember that our rooms are there to energise us and help us find our way on the troubled roads that we must sometimes follow. Gam-Anon is a way of life. It is power and it is certainly the best source of energy that I have found. A Merry-Go-Round Named Denial – By means of an imaginary play, this book shows how those primary persons in the life of a gambler can perpetuate the illness and prevent recovery, and suggests what can be done to initiate a positive program of recovery. The name of the play, and the key word in the entire illness, is “Denial” – for there is constant verbal contradiction of what is happening and what all the actors in the play are saying. Act I: The gambler has learned by chance or experimentation that the use of gambling has profound effects on him, which are psychologically beneficial. Non-specifically, it dissolves all anxiety, reduces all tensions, removes all loneliness and solves all problems for the time being. Act II: The (second actor) to appear is one we might call the Enabler… He/she sets up a “rescue mission” to save the gambler from the immediate crisis and relieve the unbearable tension caused by the situation…. Rescue operations are just as compulsive as gambling. Act III: If Act II is played out as described above, it is inevitable that at some point in Act III the gambler will again gamble… . Act II is the only act in which recovery can be initiated by (the actions) of people other than the gambler. (These other people) must learn the dynamics of the illness and (learn) to act in a completely different fashion. Fourth Step Inventory – Revised in 2001, it is divided into topics appropriate for an inventory (anger, honesty, trust, control, self-worth, etc. ), with thought provoking questions on each topic to help you with your inventory. Games Compulsive Gamblers and We Play – Revised in 2012. This is an insightful look at the emotional “mind games” played by the gambler and those affected by the compulsive gambler. Identify with the games including the “Blame/Guilt”, “Deny and Lie”, “Promises/Trust Me”, “Pick a Fight” and “Silent Treatment” and learn how to avoid them. Insights Into Recovery – Thoughts on the Steps, meetings, program tools, spirituality, and many aspects of life in general. Gam-Anon Twelve Steps of Recovery and Companion Questions – An in depth explanation of the Twelve Steps of Recovery with questions to aid in an in depth study of the Twelve Steps. 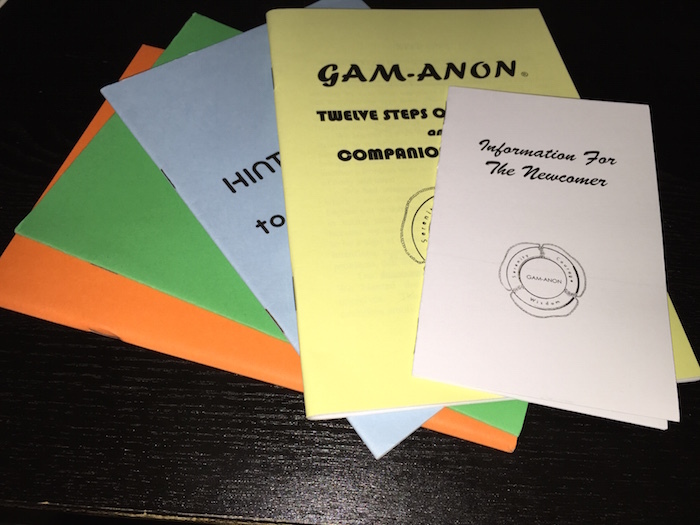 Information for the Newcomer – Welcomes the newcomer to Gam-Anon, explains compulsive gambling and the Gam-Anon program. For the Parents – A compilation of original writings by parents of compulsive gamblers. For Children – A compilation of original writings by children of compulsive gamblers. Reflections On Our Gam-Anon Experience – Over 50 inspirational writings of members with their thoughts on Gam-Anon, living with the gambler, and everything else that reflects us and the Gam-Anon experience in our lives. Past and Present – A collection of writings that originally appeared in various Conference books printed from 1979 – 1997. Conference books are written and printed by local members for a Conference and never reprinted. Handbook for Publicity and Public Relations – Guides members and meetings in their efforts to publicize Gam-Anon in their communities, manage hotlines, e-mails, and websites by following the guidelines of the Unity Steps of Gam-Anon. All literature listed above cannot be copied. The purchase of literature from your NSO makes it possible to continue to print literature for our meetings and members. All of the following are available free of charge to meetings and may be copied. They are available to groups in our google docs space or on request from National Secretary. Starting / Running a Gam-Anon Meeting in the UK – Useful information for people either wanting to start a group or running one in the UK. Flyers – Can be used for public relations, different formats available. What is Gam-Anon – Summary of what Gam-Anon is, useful for public relations. Is there a gambling problem in your family? – Can be used for public relations and for new members, includes the 20 questions. Gam-Anon Guide – Can be used for public relations, different formats available.